≈ Comments Off on What hath Netflix wrought? Because the Hayfoot and I do not have a television we rely heavily on Netflix for films and, especially, television shows. Given the intense demands of her graduate school classes and the solemn nature of my reading and writing about the Civil War and slavery, we tend to go for lighter fare. Sometimes you just have to sit back, relax, and laugh. Last night I got my credit card statement with its 60% increase in our monthly Netflix charges. I had been following the story of the company’s restructuring with moderate interest these past few weeks, but it wasn’t until seeing it in print, right there on my bill, that it really hit me. I believe the company made the right move. We are moving away from digital content contained on disc. Someday we will all look back with a laugh at the time when we got our movies and favorite television shows via the mailman. (I will miss the small thrill of opening the box and finding the little red envelope.) The other day I mentioned that the Miles Davis set I purchased may indeed be the last compact discs I ever buy. The Mac Air I bought early last month does not even contain a disc drive. When I want software I merely log on to the Apple store and download the content, which is on my computer within minutes. Remember buying Windows 95 all those years ago, driving home, and spending all that time reading the directions and uploading? Who would want to return to that? When the iCloud arrives this fall it will take things to an even higher level. So I don’t blame Reed Hastings for taking his company in this direction. Even the name changes make sense. The company does not want to associate its name with the dying industry that is dvds. 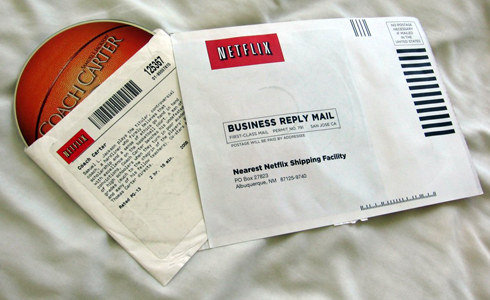 Hence Netflix represents the future (streaming) and Qwikster the past (discs via snail mail). The division of the two services may have been premature because streaming is not yet an option for all. Moreover, the amount of content available in this medium is currently limited. Still, the restructuring does make sense. The problem was in the execution. The company could have done more to explain the new model and articulate customers’ options. Personally we do not plan on leaving Netflix anytime soon, though I did modify our plan last night. What has always made Netflix so great was its quick and convenient service. If they are not careful the company may lose that. We’ll see if they learn from their mistakes and regain their footing. If not, Netflix may go the way of Pan Am and IBM. I hope not.